One of the things I love best about working in wine is the people. I find that “wine people” (both professional and not) just tend to like to have a good time. You give them half a reason to celebrate and they’re the with bells on . . . and probably more food and wine. What can I say? 🤷🏻‍ I was excited! Alsace is probably my FAVORITE region for white wines. Riesling is my desert island white grape. I have to actively keep Riesling from slipping tooooooo often on 8 & 20. There’s a Riesling to pair with just about anything. When I have a dish that’s tricky to match, the answer is probably Riesling. (. . . Ok, or bubbles.) A lot of the other nobles grapes of Alsace aren’t too far behind in terms of versatility. If I haven’t shared my great love for Alsace and Riesling before on here, well . . . we’re about to take a deep dive. Since there are sooooo many wines to share, plus the food, I’m going to split this into 3 posts. It’s Alsace-a-palooza! • Today I’ll start with the wines . . . and there's A LOT to cover! • Then we’ll get into the appetizers, which included a cheese and charcuterie plate and Flammekueche (aka Tarte Flambée). 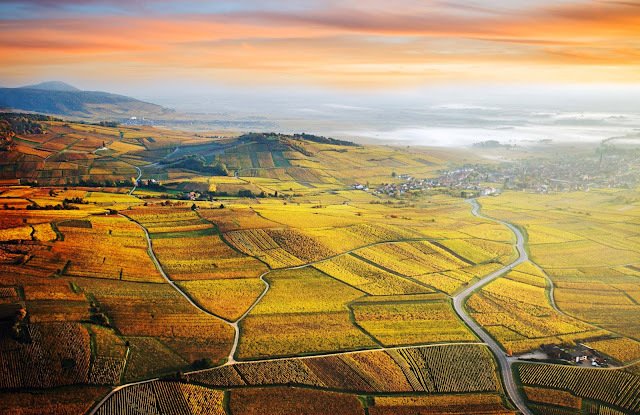 Before we jump into the pool of wines we have today, let's take a quick look at Alsace as a region. Here is a primer on the region. 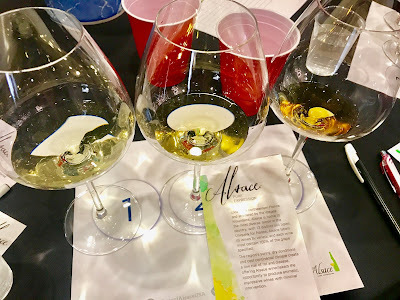 • There are 4 Noble Grapes: Riesling, Pinot Gris, Gewurztraminer, and Muscat. These wines tend to be very aromatic, each in their own way. Flowers, spices, smoke, stones, and fruit––it’s all there! Grand Cru wines must come from these grapes. As a quick reference, Riesling from Alsace tends to be richer, more robust, and drier when compared to German versions. • You’ll also find Sylvaner, Pinot Blanc, Auxerrois, Chasselas among the white grapes. Chardonnay is also around, mostly for use in the bubblies. White wines make up 90% of the production. A little geeky tidbit: There’s a minor exception to the Grand Cru rule above. Sylvaner can produce Grand Cru wine if it comes from one special site–Zotzenberg Vineyard. • Pinot Noir is your red option here. NOT ALL RIESLING/ GEWURZTRAMINER/ MUSCAT IS SWEET!!!!!!!!!!!!!!!!!!!!!! I admit that this is a pet peeve of mine, but I say it full of fierce love and kindness, because y’all are missing out! All of these grapes can and are often made completely dry. Particularly Riesling and particularly from Alsace can be minerally, crisp, scrape-your-freaking-tongue-off, BONE DRY! I dare you try the Trimbach Riesling below, for example, and tell me otherwise. Go on, I dare you! Ok . . . calming down and moving on. Alsace is the only French region that varietally labels their wine as matter of course. 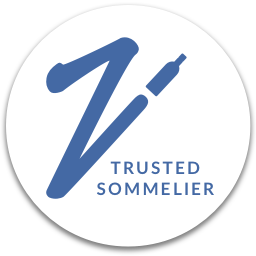 There are some blends which you might find under the names ‘Edelzwicker’ or ‘Gentil,’ but the overwhelming majority is varietally labeled. The region is located in the northeastern corner France, above Switzerland and right up on the border with Germany. The region is protected by the Vosges mountains, which are super important because they block the rain and create a sun bowl. The result is that despite the fact that this is a continental region, it’s pretty mild. It’s actually one of the driest in France. Map provided by Teuwen Communications. You can also find additional information here. Alsace has a fascinating, but difficult history thanks to that border with Germany. Think back to your high school European history class and ALL of the wars these two countries were in over the centuries. Just about every time there was a war, poor Alsace got kicked back and forth between France and Germany like a soccer ball. The result is that Alsace's culture, food, and language all have aspects of both blended in. Also, despite everything, you’ll notice as you go through the wines that many of these producers have been here for a very long time. 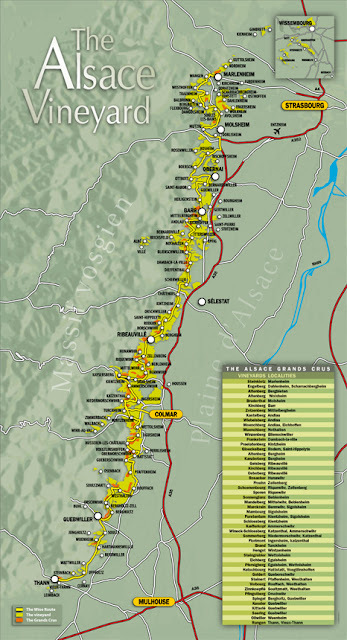 • AOC Alsace makes up 71% of the production. 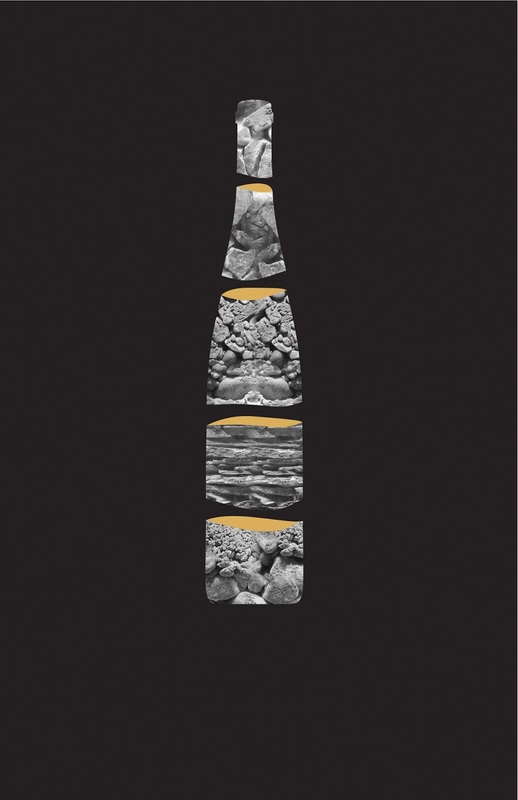 • Crémant d’Alsace, traditional method sparkling wines, make up 25%. • AOC Grands Crus makes up 4%, predominantly from Riesling, Gewurztraminer, Pinot Gris and Muscat d’Alsace. 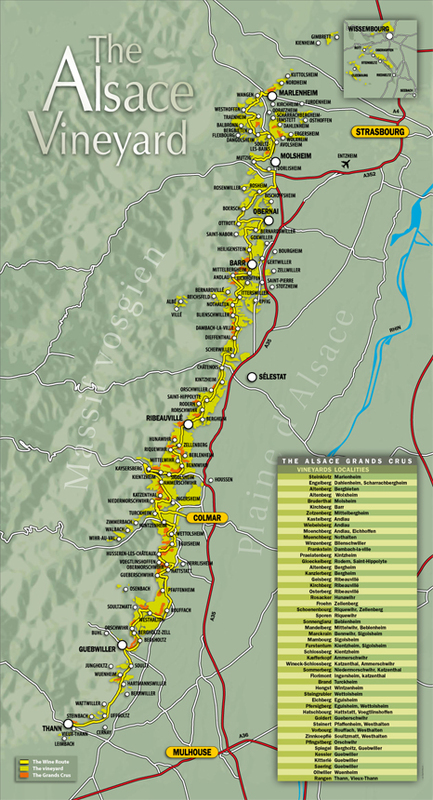 There is one big Grand Cru AOC, made up of 51 total vineyard sites. Geeky aside on the Grand Crus: Not everyone agreed on the system when it was established, so some producers opted out completely for many years and choose not to label their eligible wines Grand Cru. Notable among these are benchmark producers Trimbach and Hugel, but more on that later. As per my little rant above, these grapes can make the full range of wines from dry, to sparkling, to sweet. You’ll find the full-on dessert wines under Vendanges Tardives (VT) and Sélection de Grains Nobles (SGN). These wines can be phenomenally complex and interesting! • Vendanges Tardives (VT) are late harvest wines made from Gewurztraminer, Riesling, Pinot Gris or Muscat d’Alsace. Grapes must be hand-picked and are often botrytized. • Sélection de Grains Nobles (SGN): Same varieties but with multiple rounds of selective, hand-harvesting and all botrytized grapes. They’re super diverse here with 13 different types, giving it the most diverse terroir in France. The logo for the #AlsaceRocks campaign illustrates the diversity of soils. All that happy, dry, sunshiny weather lends this region well to green farming practices. As of 2017, 15%+ of all vineyards in Alsace were organic or biodynamic, making the region one of the greenest in France, according to info provided by Teuwen communications. Image provided by Teuwen Communications. If you want to take an even closer look at the region today, I recommend this hand-dany guide from WineFolly.com. I’ve included all three of our notes here, when possible. I think it’s interesting to see where we diverge, since we all do have our own palates and preferences; but more often, it's interesting to see how similar the notes are... And sometimes we're just having fun. I organized the wines here first by style/grapes tasted. 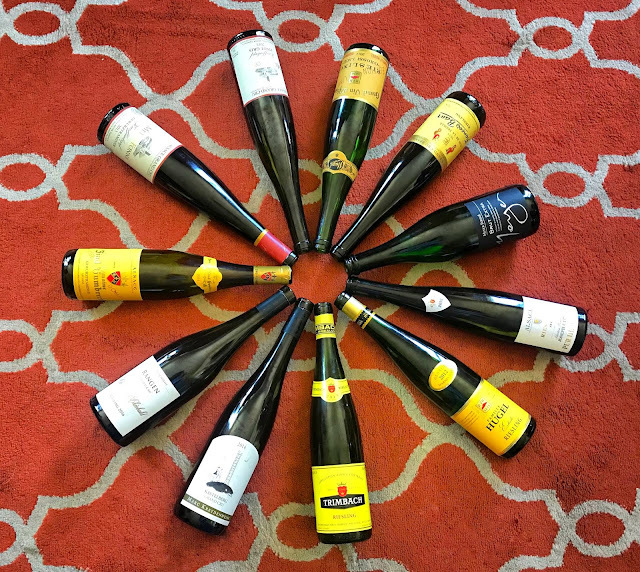 Within those categories, I organized them in descending order of vintage, with the exception of three Hugel Rieslings, since I find it interesting to see how different three bottlings from the same house can be. We have wines from all different price points represented here–from about $20 to $100. I’ll also note that while many of these wines were provided as samples, all opinions are my own, or my friends’ where indicated. (No other compensation was provided.) I was also pretty familiar with a lot of these producers already and was excited to welcome these bottles in as old friends! Like I said, Alsace is probably my favorite region for white wines. I profoundly would love to go some day! How beautiful is that?! Image provided by Teuwen Communications. This is a lot to take in, but I’d say the other things to take away from this are the broad range of terroirs and styles of the wines. Taken from the Kermit Lynch and Meyer-Fonné sites, for this and their other wines to follow. and slower, creating a more lush texture. Vinified in the méthode champenoise. disgorging, when a minimum of dosage is added. 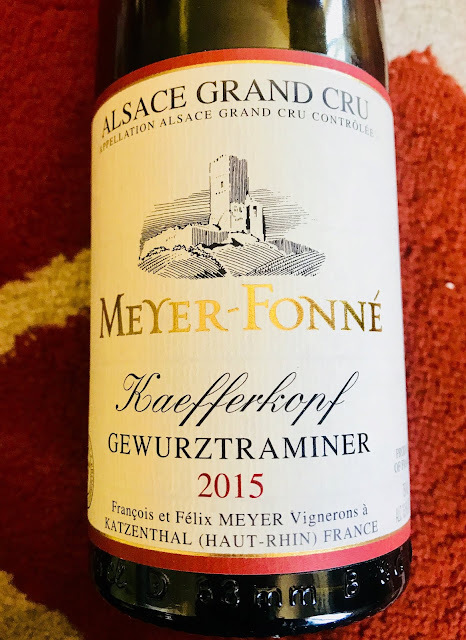 About: Félix Meyer is the third generation in his family to be making wine since his grandfather founded the domaine in the late 19th century. Félix took over in 1992 and set about modernizing equipment in the winery, developing export sales, and now expanding the family’s holdings in many of Alsace’s great vineyard sites, including several grand crus. The winery and family home is in the village of Katzenthal, known for its distinctive granite soils. 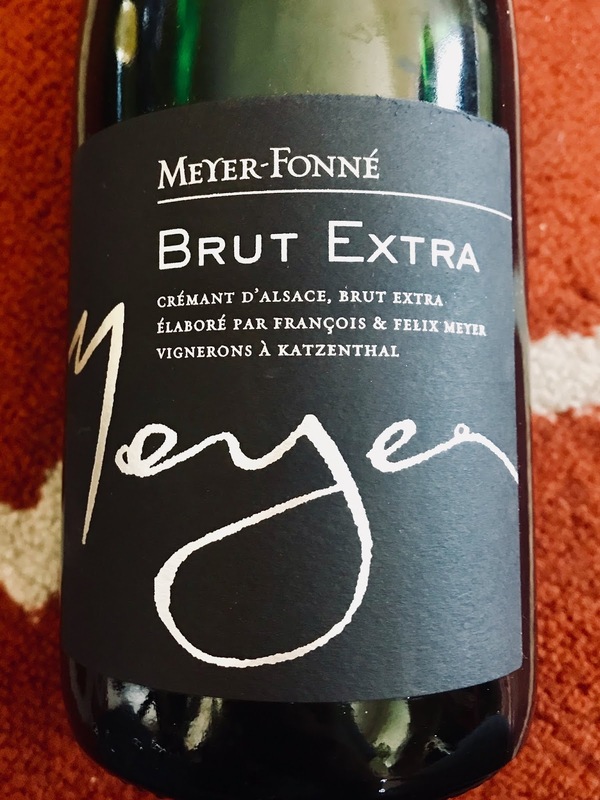 Meyer is a master at the art of blending, mixing the wine from various parcels into complex, balanced cuvées. He also believes in raising his wines on fine lees in large, older foudres, as was the tradition in Alsace. Me: Fresh and crisp with gold apples, lemon, and toasty almond notes. This was awesome with the Tart Flambée!Heather: Lively mousse, refreshing with apricots and marzipan. Kristie: lime zest, yellow apples, biscuits, and sour cherry. Farming: Organic. See above for more detail. Vinification: The whole grapes are gently pressed in a pneumatic press for 4-10 hours, and then the must is left for 24-36 hours to allow the heavy lees to settle. Fermentation takes place in temperature-controlled stainless steel tanks or oak barrels over a period of 1-3 months. The wines are racked two weeks after the fermentation has completed, and the wines are kept on the fine lees until the September bottling. Me: Off-dry. Very rich with steeped peaches and baked apples. Honeysuckle, but with a savory peppery finish. On its own rather viscous, but work well with the fatty bacon in the tart. Heather: White pepper, peach, white flowers. Kristie: Apricots, wet wool, black pepper, flinty, blood orange. Full with a lot of viscosity, and the acid on the low side. Image borrowed from their site. Info for Trimbach wines taken from their website and the Esprit du Vin site. Farming: Sourced from the Trimbach’s family’s own vineyards and from growers with whom the family has long-term relationships. Average Price: $20 – really good QPR. About: Since 1626, the Trimbach family has been promoting the history, exceptional terroirs and fine wines of Alsace. Maison Trimbach is located in Ribeauvillé, where today three generations work closely together. Day-to-day operations are handled personally by brothers Pierre and Jean Trimbach, representing the 12th generation. Bernard and Hubert Trimbach, the 11th generation (father and uncle, respectively, to Pierre and Jean) remain integrally involved. Anne, the eldest of the 13th generation, has just joined the family business. Just Me: Peachy with honey dust, white flowers, spice, hay, and chamomile. Lots of bright acidity and much leaner than the Meyer-Fonné. I’ll note that I last tried this wine at the Wine Bloggers Conference in November during a seminar on Alsace Pinot Gris and my tasting notes were remarkably similar. Info for the next three wines taken mostly from the Frederick Wildman and Hugel sites. 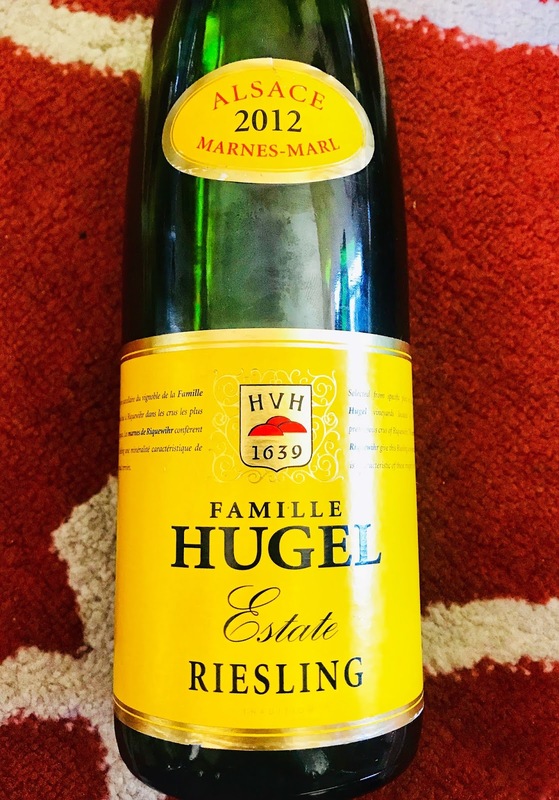 About: The Hugel family has been making wine in Alsace fro over 370 years and 13-generations. Located in the picture-postcard fortified village of Riquewihr, has earned a worldwide reputation for their Alsace wines. their wines are released only when the family agrees they’re ready; the focus is ultimate quality. 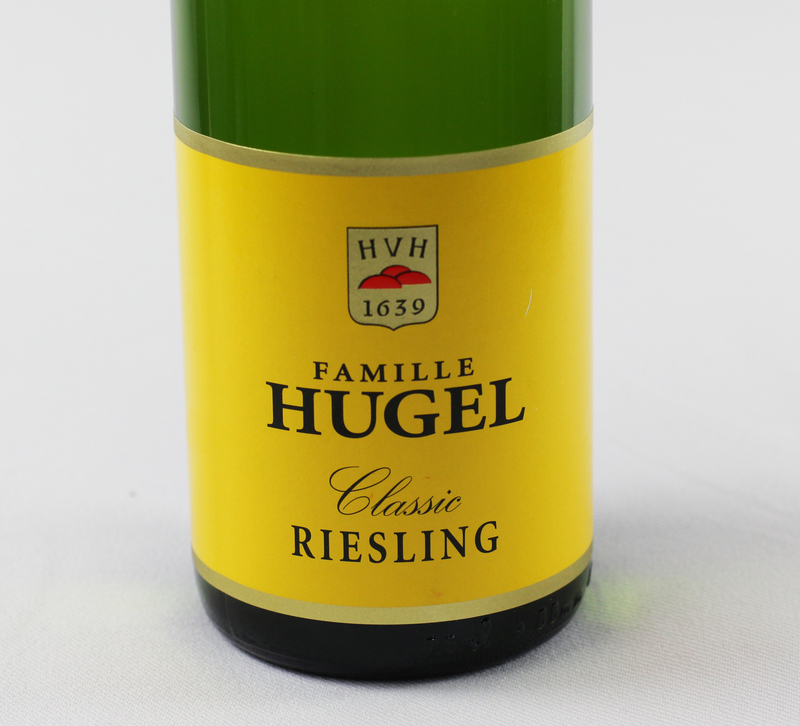 Hugel has pioneered much advancement in Alsace, including the early creation and classification of the Grand Cru vineyards. However, when the system fell short, they stepped away from the system altogether. 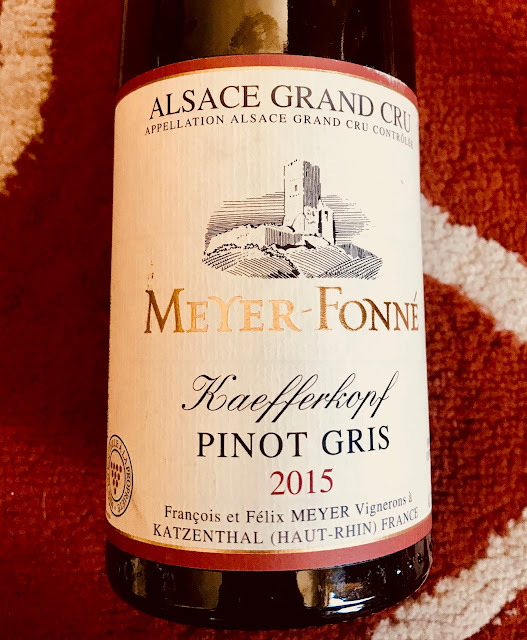 As a bit of a compromise, they’re now labeling their Grand Cru Wines “Grossi Laüe” which translates to “Great Growth” from the Alsatian dialect, the equivalent of “Grand Cru” in Burgundy or “Grosses Gewächs” in Germany. Soil Type: Predominantly clay and limestone vineyards. Farming: Sustainable practices. 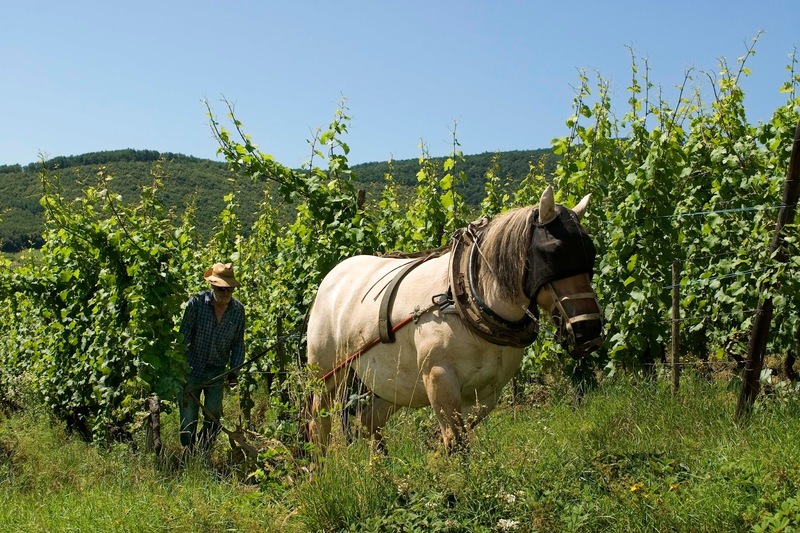 Hand harvested grapes from a dozen of the most favored localities in and around Riquewihr. Vinification: Fermentation takes place in temperature controlled vats followed by natural clarification in neutral vessels over the winter. The wine is lightly fined and gently filtered prior to bottling in the spring. Price: Currently $17.99 on K&L. Good QPR in my opinion. Me: Petrol, lemon, savory, with stones galore. Heather: Good acid, a little heavy, not my favorite. Kristie: Petrol, lime zest, clay, nectarine. The "Estate" line is a new selection "parcellaire" of carefully chosen plots of the estate situated in the most prestigious crus of Riquewihr. Soil: Clay and Limestone. Marl soils of Riquewihr, in and around the Schoenenbourg. Farming: Most of the plots chosen for this new wine are being converted into organic viticulture. Vinification: Grapes are taken in small tubs to the presses, which are filled by gravity, without any pumping or other mechanical intervention. After pressing, the must is decanted for a few hours, then fermented in temperature-controlled barrels or vats (at 18 to 24°C). The wine is racked once, before natural clarification during the course of the winter. The following spring, the wine is lightly filtered just before bottling, and the bottles are then aged in the cellars until released for sale. The entire production of this wine is closed with DIAM the cork without the risk of cork taint. Me: Really bright and lively, almost spritzy, with a stony backbone. Petrol joins in on the finish. On the drier end of the spectrum of this evening’s wines. Lots of citrus. Kristie: Petrol, almost fizzy texture. Grossi Laüe signifies the finest vineyards in Alsace and represents an equivalent to the German Grosses Gewächs or the Burgundian Grand Cru. As noted above, these wines are basically their Grand Cru wines. If you’re already familiar with Hugel, this line takes the place of the Jubilee line. Soil Type: Keuper, marl, dolomite and gypsum, rich in fertilising agents, overlaid with fine layers of quaternary siliceous gravel, Vosges sandstone and Muschelkalk, with at its eastern extremity outcrops of Lias marl limestones. Vinification: Same as the Estate line above. Additional recommendations: Will gain in complexity for 8 years or more. Makes the ideal partner to fish or seafood dishes. Went well and became more peppery with the asparagus and white bean salad. From their tech sheet and Weygandt-Metzler website. 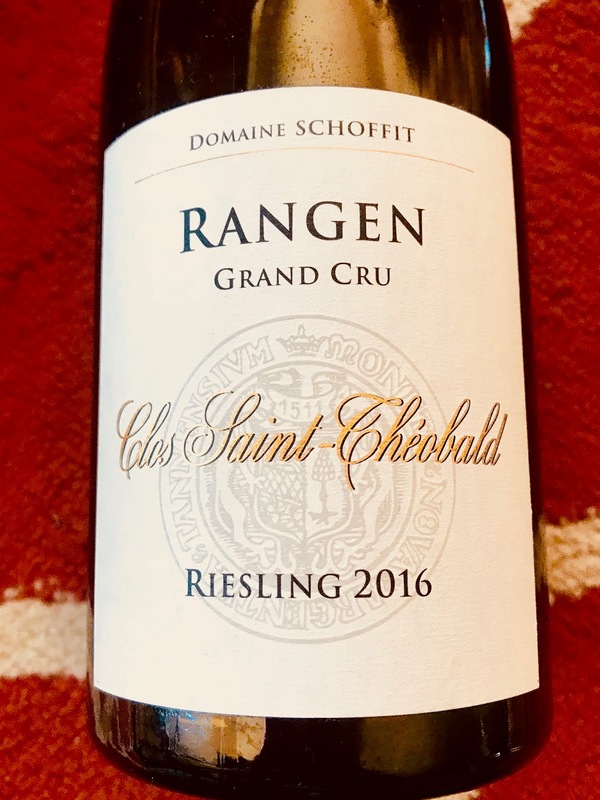 About: 25 years ago, Bernard Schoffit, then still very young, embarked on an ambitious program of buying land in Rangen, around the Clos St. Theobold. Totaling nearly 16 acres, a good part of it had been abandoned because it was too steep to work. Through sheer determination and ambition, he revitalized the entire vineyard. The slopes are incredibly steep and yields are extremely low. Me: Pear, flowers, lemon and peach. Fresh and floral with lots of flinty, dusty stones, and clean honey. It somehow manages to be both generous and austere. Nice clean fruit notes and light spice, but with stones and petrol at the core. A bit off-dry. Brought out the nutmeg notes in the chicken dish. Kristie: Caramel apple, green apple, clean, honey. Taken from their tech sheet and their website . Soil Type: Largely granitic with a topsoil mix of sandstone, granite and marlstone, and in parts, two types of mica which contribute to the wines’ complexity and finesse. Vinification: 100% whole cluster pressing. Fermented with indigenous yeasts. Aged on the lees in 150 year old French oak barrels until the bottling in July. 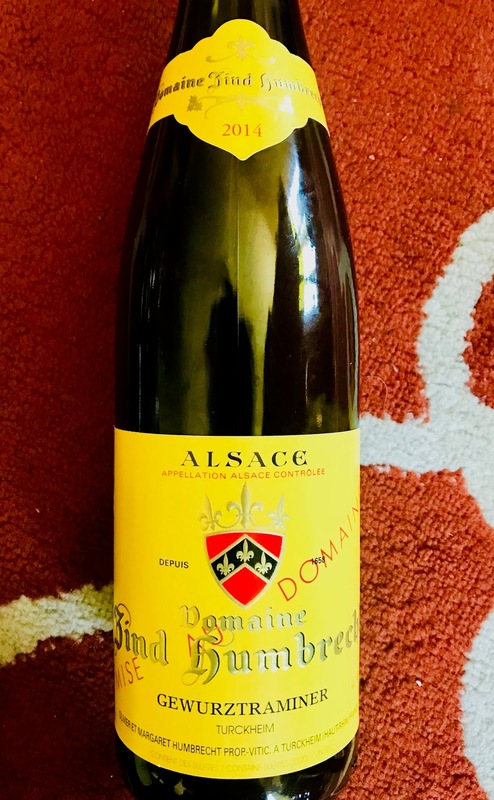 About: Producing wines in Alsace for 9 generations, Domaine Baur is currently run by Pierre and Thomas Baur, the son and grandson of François, respectively. The estate comprises 27 acres of vines. Half of these are within the Brand Grand Cru, making the Baur family one of the largest landowners in Brand. The Brand Grand Cru is known for its steep slopes (853 - 1,181 feet), south/southeast exposure and ample sunshine. Me: Round, tangy peaches and apples, but with a stony background. Hints of spice with a bit of funky earthy note. Heather: Lovely acid, peach, floral, zing. I’d drink this on a Tuesday . . . and a Saturday! Info taken from their tech sheet and their website. Soil Type: Schist. Riesling is exclusively grown in Kastelberg’s blue and purple soils. Farming: Biodynamic. Steep slopes allow for maximum sunshine, but ocean winds from the Champ du Feu massif and north winds from the Crax mountain regulate temperatures. About: Marc Kreydenweiss was born in Strasbourg in 1948 and comes from a long line of winemakers who have lived in Alsace for over three centuries and has owned and operated the 30-acre Domaine since 1971. In 1984, he made the decision to exclusively produce extremely high-quality wine with the focus of expressing terroir. The winery has been certified biodynamic since 1989. 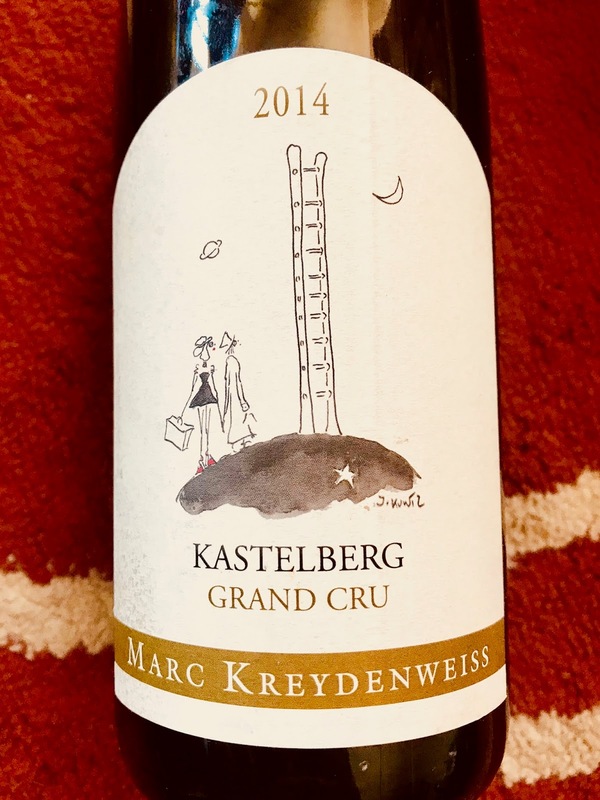 Today, Kreydenweiss farms a little less than 30 acres of vineyards in Alsace, which include portions of three Grand Cru vineyards: Kastelberg, Moenchberg, and Weibelsberg. Me: Lots of citrus with grapefruit and tangerine. Ginger and white plums, petrol, with light bitter herb notes in the background. Heather: A little Volatile Acidity (VA) on the palate, beautiful acidity, meaty for a white, like a veggie burger. Kristie: Some VA, notable phenolics on the palate, petrol, white pepper, lime zest, petrichor. I’ll note that I’m not particularly sensitive to VA, so I’d definitely trust them on this one. Thankfully, VA blows off anyways. Trimbach is famous for their dry style. They make two of perhaps the most famous Rieslings of the region, and possibly anywhere–Clos Ste. Hune and Cuvée Frédéric Emile. If you ever get the chance to try these, DO! Like Hugel, next, they initially opted out of the Grand Cru system, but apparently this is changing. I have a particular soft spot for this wine, as it was one of the first wines that made fall in love with Riesling for its complex mix of flavors, always really dry and robust. I can almost always find it for a reasonable price as well. Soil Types: The vineyards were planted on the Ribeauville’s fault line that fractured 50 million years ago between the Vosges Mountain range and the Black Forest offering a mosaic of terroirs including the complex calcareous limestone and bio-degraded seashell fossils called “Muschelkalk”. Farming: The specific vineyard plots for Trimbach Riesling are selected each year by Pierre Trimbach. Vinification: Fermented in temperature-controlled stainless steel and concrete vats. There is no secondary malolactic fermentation in order to maintain as much natural acidity as possible. Me: Petrol, peaches, lime and grapefruit skin. Lots of acidity and tons of stony minerality. On the more austere end of the spectrum. Classic. Kristie: Wet stones, apricots, white flowers, high acid. Taken from the tech sheet, their website, and the T. Edwards site. Soil Type: Marl and limestone. 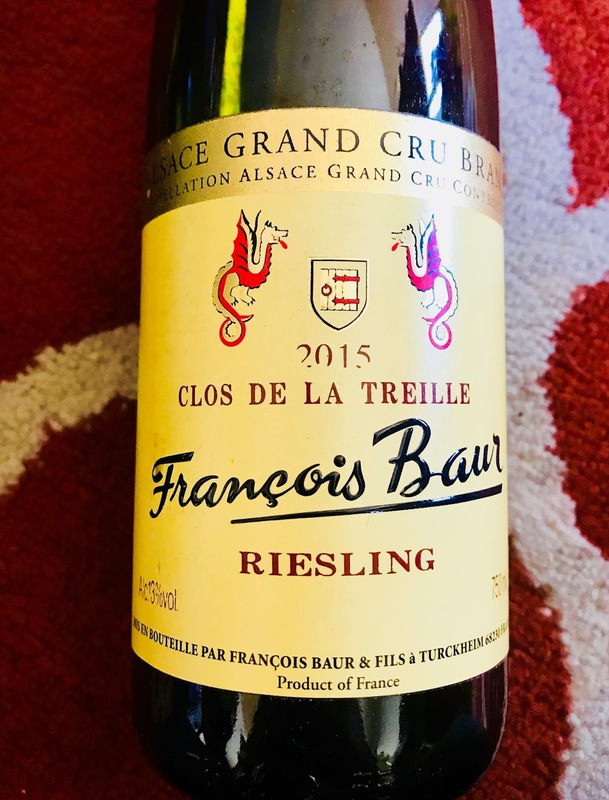 This Riesling is produced from a selected plot located in the southern part of Alsace, near the village of Voegtlinshoffen.The vines are located in the prestigious Upper Rhine and are planted on the mostly southeast facing slopes at the base of the Vosges. aged in bottle for several years. Vine Age: Planted in 1990. About: The Cattin family, of Swiss descent, can trace their arrival in Alsace to around the year 1720. The family settled in the village of Voegtlinshoffen.Being that the region had been famous for its wines since the Middle Ages they immediately planted vines and began the viticultural legacy that continues today. The estate is named for Joseph Cattin who was renowned for his pioneering work in grafting and is widely credited for saving some of Alsace’s best vineyards from phylloxera. Today the Estate is run by Jacques and Jean-Marie Cattin as well as the latest generation, represented by Jacques Jr.
Me: Very distinctive. Stony with almond paste. This wine has a little age on it, and there’s a slight whiff of an almost a sherry-like lightly oxidized quality, in a pleasant way. This goes away as the wine warms up, but keeps the almond. Tropical fruit notes of dried mango. Some said it had a toasted coconut note and was the favorite of several. Vinification: See vinification for their Pinot Gris. Me: Like their Pinot Gris, this is a big, rich, and robust. Honeyed Lychee, lots of ginger, white pepper. Unctuous. Semi-Sweet+ – Almost worked with the red velvet cake with had for dessert. From the Zind-Humbrecht and Kobrand sites. Soil Type: Gravely soil on valley floor. Farming: Certified Organic and Biodynamic. The vineyards used to make this wine all originate from the Cru Village Turckheim. Vine Age: 45 years average. About: Domaine Zind-Humbrecht has unbroken winemaking lineage in Alsace since 1620. The Domaine came by its current name in 1959 when Leonard Humbrecht married Genevieve Zind. In the 1960s and 1970s, Leonard was able to expand the winery’s collection of Grands Crus and other high quality vineyards. Zind-Humbrecht is managed by Olivier Humbrecht, one of the world’s only winemakers to attain MW status. His passion for Alsatian wines and Biodynamic farming translates into a portfolio of legendary wines recognizable for their purity, intensity and, above all, their faithful expression of each individual vineyard site. Me: Flowers and lychee, lightly peppery with tangerine, ginger, white plum. A hint of savory herbs come in on the back end. A hint of off-dry, but with freshness and much lighter and more lithe than our other Gewurz. Kristie: Honeysuckle, bee pollen, honey, dirty yellow nectarine. Sample wines provided by Frederick Wildman and Teuwen Communications working with Wines of Alsace and the #AlsaceRocks Campaign. Thank you so much! 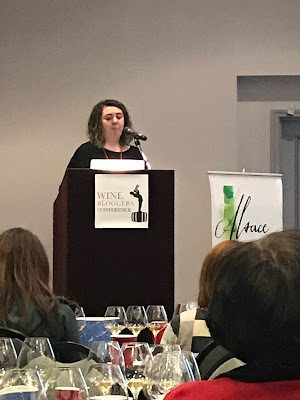 Here’s a quick shot of the lovely Cassidy Havens from Teuwen leading the Alsace seminar at the Wine Bloggers Conference. Happy to say I know Cassidy a bit–we’re in a tasting group together here in Oakland. By some horrible trick of fate, the night I had this wine dinner with my friends happened to be the same day that the news of Anthony Bourdain’s death in Alsace broke. With the group made up largely of people in the food and wine industry, you can probably imagine that many us were profoundly affected by the news. He meant so much to so many of us. We toasted in his honor and shared our memories. I will leave you with this link to resources for mental health and suicide prevention compiled by Chefs with Issues. Here are my own thoughts on what he meant to me. Moving things back to a more positive note, let’s see how the rest of the French Winophiles have explored Alsace! Wow, your group was brave to take on such a deep and broad (and large number!) of wines. I'm looking forward to reading parts 2 & 3! What an evening! And what a wonderful space to be in when hearing the sad news of Anthony Bourdain's passing; a group of passionate people exploring food and wine and great company. I will admit to craving a spreadsheet to line up your findings by soils and regions and vintages...so much to explore! So much to enjoy. Thanks for a great piece, can't wait for Part 2! Thanks so much Robin! I have to admit, I think making a spreadsheet would probably be a great idea here. I might have to do that.